WK2 SRT8 Wheels & Tires This section is to discuss wheel and tire options for the WK2 SRT8. 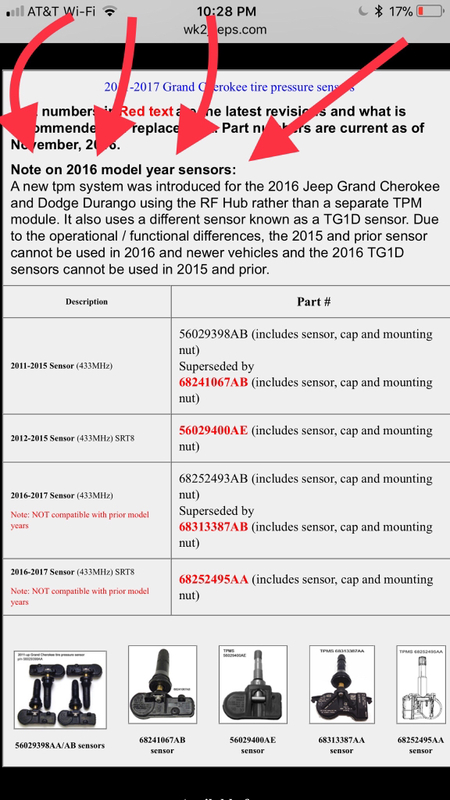 Cherokee SRT8 Forum > WK2 Jeep Grand Cherokee SRT8 Discussion (2012+) > WK2 SRT8 Wheels & Tires > Does the SRT use different TPMS than other WK2's? Thanks for the info Viking! I got my new black chrome wheels on and need new sensors. I had my new tires put on about 6 months ago, and I brought these 2016 model sensors with me for the new wheels on my 2016. I used the 6825 2495 AA, and I was told by the mechanic they were the wrong part number. Any thoughts on why that might be? Does the SRT use different TPMS than other WK2's? Did your mechanic provide the “right” part number? Last edited by viking757; 10-12-2017 at 06:01 PM. 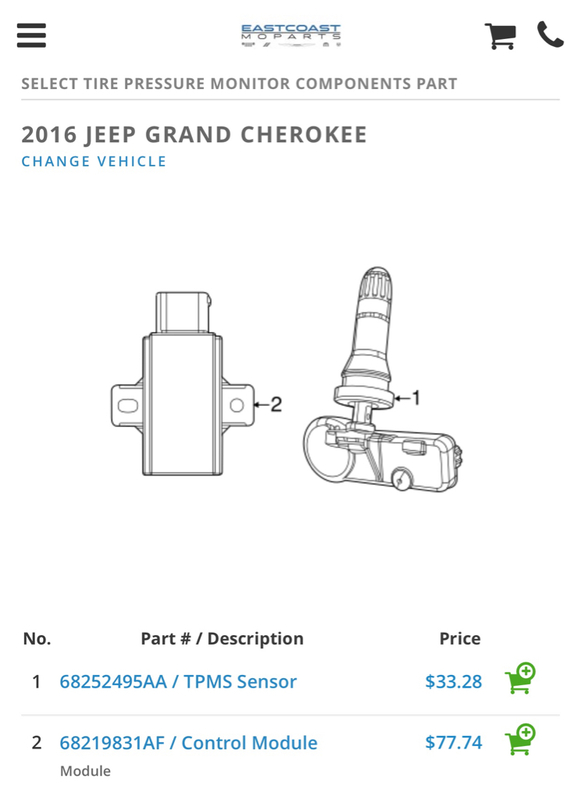 @viking757 I had Googled it, and it looks like I didn't realize I needed both the TPMS Sensor AND the Control Module. I'm assuming (now) those two pieces need to be used in conjunction to have a "complete" system? Thanks again for the clarification. I do not believe you need to purchase the control module in tandem with the TPMS. It’s rare that the control modules have issues. Just to close this out, because I may have confused some people. I ordered the TPMS sensors, but they didn't come with the stem valve (since I don't know what it's called) that gets capped. So, in Viking's post that has the diagram, I was missing the part that #1 is directly pointing to. I only had the sensor below. I had taken it into a performance shop in Northern VA, so they didn't have Jeep specific parts on hand. I ended up getting it done at a Jeep dealership. Thanks for everyone's help. Hope this made sense.